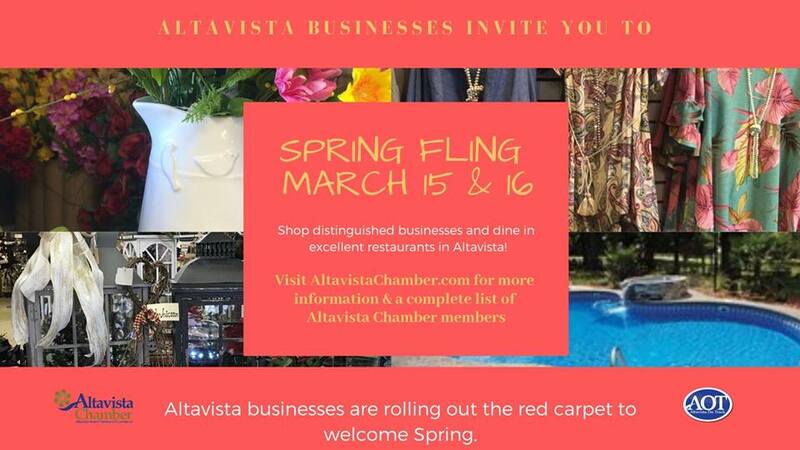 Join us in Altavista for the annual Spring Fling event! Follow the event on Facebook for more information and participating businesses. Join us on Main Street, Altavista for our annual Christmas Parade! Shop small, shop local, shop Altavista for this holiday season! Join us on Saturday, November 24th from 9:00-5:00 P.M. to shop all of your favorite Altavista businesses… and best of all, get all of your holiday shopping done without fighting the lines, traffic, and crowds! Join the Altavista business community as they open their doors to let the holiday season (and shopping) begin! Participating businesses will be holding sales, promotions, open houses, events, give-away's, freebies, and more, all to welcome in the holiday season. Grab your best friends and your family and come see what all Altavista has to offer, and while you're at it... cross Christmas shopping off your to-do list! Each year we host the Altavista Scarecrow Stroll. Businesses are invited to make their own scarecrows and post them up in front of their businesses or downtown for visitors and residents to vote on them. The event is a fun and family friendly way to celebrate fall in Altavista. The winner who earns the most votes wins $100! Join us downtown on Broad Street for the food truck round up! The event will take place on Broad Street from 5:30-8:99 P.M. and we will also be partnering with the Staunton River Memorial Library as they host an open mic night!